> Outstanding Contribution Award - Susan Conklin of the Good Neighbors Food Pantry. 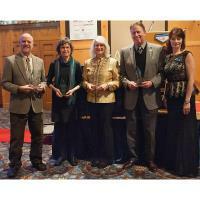 > Outstanding Contribution Award - Jean Van Dam of Van Dam Custom Boats. > Outstanding Contribution Award - Adam Kennedy of Friends of the Boyne River. > Ambassador of the Year Award - Brian "Koz" Kozminski of True North Trout. > Sally Roselli Business Leadership Award - Bill Scott of Great Lakes Energy. Details on the award winners.